Times are changing in the way people use the mail service in Canada and the world. The continued advancement of the electronic age means traditional mail such as letters is declining while other mail such as parcels is on the up swing. 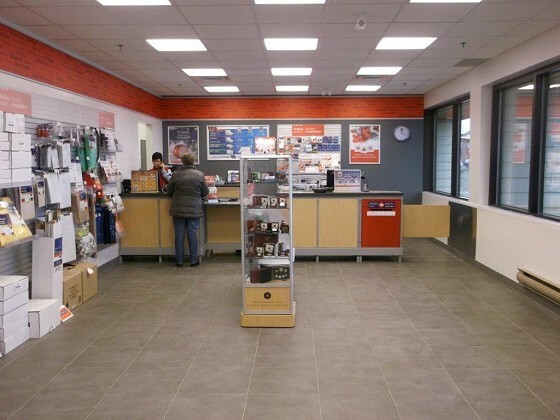 To better serve their business customers in Thunder Bay, Canada Post has just completed a renovation of their mail office at Alloy Drive in Thunder Bay. “ We could call it a revitalization. It is a cleaner, fresher look and a better location for our business customers as they won’t have to go into the back of the building any more. The work space is a lot safer for our customers and employees,” said John Caines, Spokesperson for Canada Post.“ It is going to have all our current corporate imaging and branding and is an exciting time for us.” The Canada Post renovation has added counter space as well as parcel compartments. These will allow people who are coming in to pick up a parcel to not stand in line. When you go to get your mail from your postal box there will be a key in there indicating in which postal compartment you have a parcel waiting for you. You open it up, pick up your parcel, put the key back and away you go. “ The office is much more customer friendly. We will be open from 8:30am to 6pm so will offer better hours for our customers. We are excited about the new office. It is an image of other offices we have done in other cities.”said Caines. Canada Post hasn’t done that well financially recently and announced a third quarter loss of $109 million for the period ending September 28, 2013 according to Caines. Canada Post is not a department of government but has been a crown corporation since 1981 with its own board of directors. They don’t have any taxpayer subsidy but generate all of their own revenues.